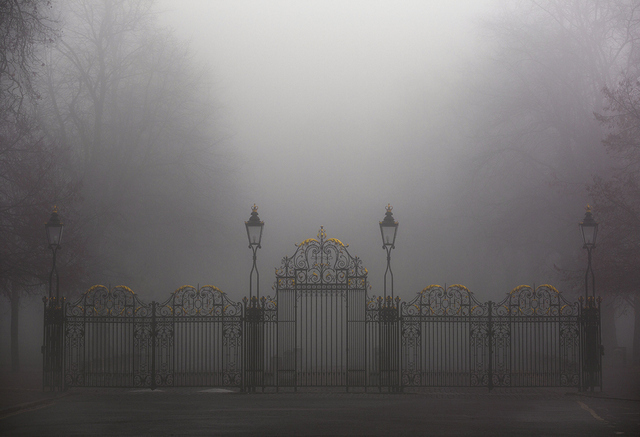 A park is only just visible beyond these gates. Copyright Albert Zhang. A great view from the Royal Observatory catching the city, Canary Wharf and the O2 arena in one panorama. Copyright Albert Zhang. 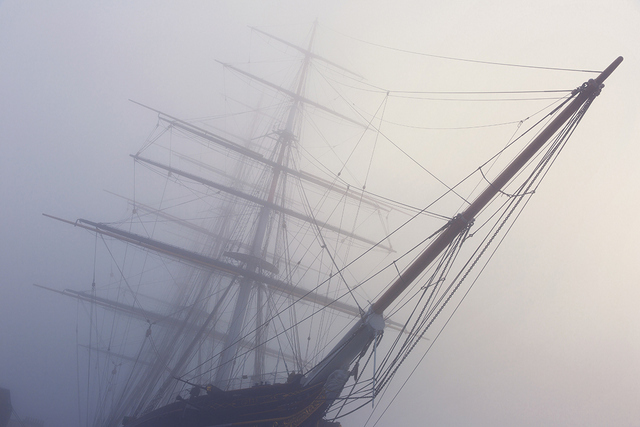 Cutty Sark slices through the fog. Copyright Albert Zhang. A lone boat adrift on the Thames. Copyright Albert Zhang. The meridian line in the fog. Copyright Albert Zhang. 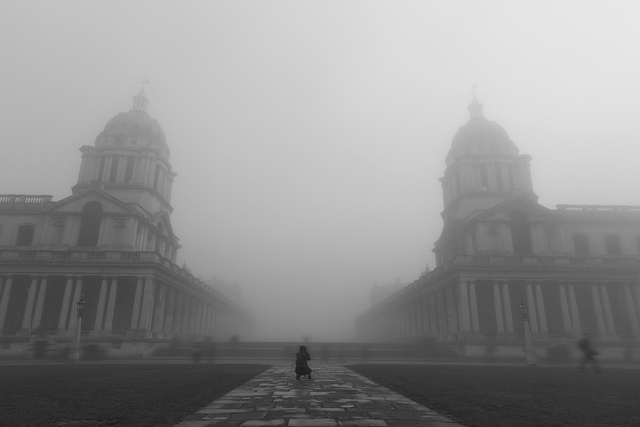 Another photographer trying to capture the Royal Naval College. Copyright Albert Zhang. 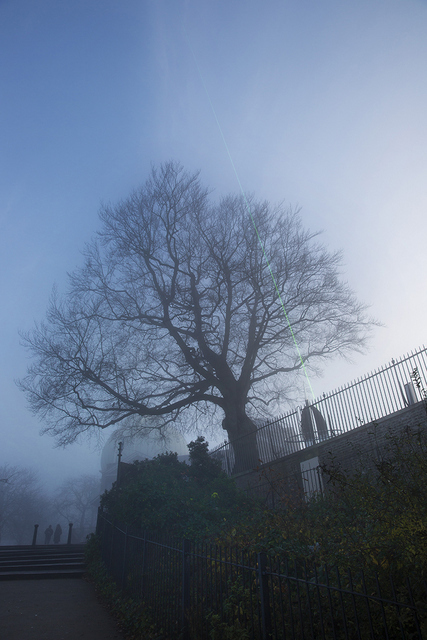 We Londoners know that the Victorian vision of a city shrouded in fog is no longer the case, and only on rare winter days do we get the sort of fog that leaves us barely able to see a few metres in front of us. But the idea of London as a foggy city is a stereotype that still exists in China; when Oliver Twist was translated for a Chinese audience it was re-titled 'The orphan in the foggy capital'. It's surprising for Chinese visitors to find that London isn't actually that foggy, so when heavy fog did roll into London on December 11 2013, Chinese photographer Albert Zhang jumped at the opportunity to capture these stunning photographs. Around the same time in Eastern China a fog also descended but it had been caused by air pollution, resulting in massive disruption and forcing many people to stay indoors. The idea behind Zhang's photographs is to compare the two nations in terms of the causes of fog and what this means to the UK and China. Even though London still suffers from high levels of pollution, the deadly pea souper fogs are thankfully in the past, while for industrial China it presents a real risk to health and infrastructure. These are beautifully composed photographs, but they also carry a serious message about the pollution threat facing Zhang's home country. 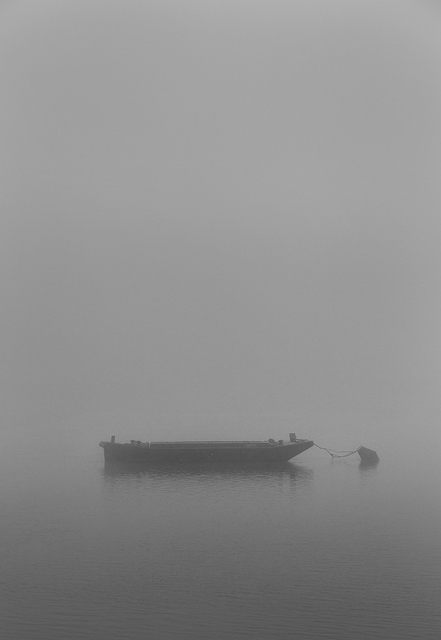 Chasing Fog: Albert Zhang will be on at Camden Image Gallery, 174 Royal College Street, NW1 0SP from 26 June to 1 July. Entrance is free.